In healthy teeth layers of enamel protect the teeth both above and below the gum line. Underneath these protective layers is dentin. Dentin contains microscopic tubules (small hollow tubes or canals). When dentin loses its protective coverings these tubules allow heat and cold or acidic or sticky foods to reach the nerves and cells inside the tooth. Dentin may also be exposed when gums recede. The result can be hypersensitivity. The good news is that sensitive teeth CAN be treated. Your dentist may recommend a desensitizing toothpaste, an in-office flouride treatment, a crown or bonding to correct a flaw or decay, a gum graft, or a root canal. And of course proper oral hygiene is always the best defense against tooth sensitivity. 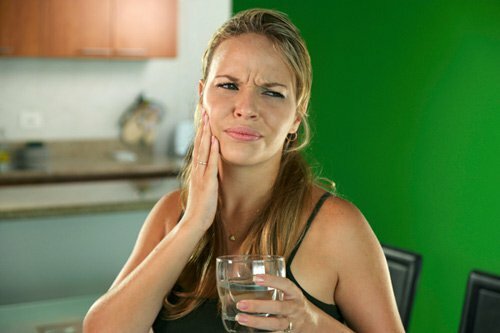 If you have tooth sensitivity, schedule a visit with your dentist to discuss the best options for you. For more information, visit this link from the American Dental Association.